If your tile, marble, or granite looks dirty, dingy, or damaged, you don’t have to leave it that way. Instead, contact us for granite and marble restoration services. Our team at Aldayna Stone Care & Maintenance has been serving Passaic County, NJ, and the surrounding areas for over 40 years. We maintain, restore, and clean all marble and granite surfaces, including floors, walls, bars, vanities, showers, and other surfaces. 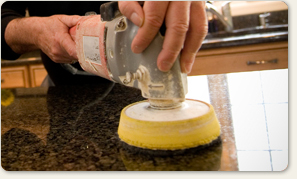 We polish, seal, clean, hone, maintain, and restore both granite and marble. We also offer grout cleaning, grout color sealing, and janitorial services. Each member of our team is fully bonded. We never use outside or subcontracted help so you can be sure you’re getting the service you signed up for. Because we operate out of our own marble service vans, we are able to supply our own maintenance and cleaning solutions. Our friendly, courteous team is dedicated to making sure you are happy with your marble, granite, and grout. We want to make your home or office countertops and floors shine. If you’re needing granite and marble restoration services in the Passaic County, NJ, area, call us today for a free estimate at 973.239.1351. Aldayna Stone Care & Maintenance Inc.